Well hello again, it’s been a while. A full three weeks has come and gone since my last post, what with being so busy and all. This time of year is rammed full of festivals, food shows, bank holiday events and all manner of summer shenanigans – the practical upshot being that I’ve been so busy selling/cooking/bottling/labelling/having a bit of a lie down that the blog ha remained completely untended. You have my apologies, I know that you are all sat waiting, precariously perched edge-of-the-seat style, finger-bitingly anxious to hear what the Chilli Hobbit has been up to lately. Or not. Maybe the latter. 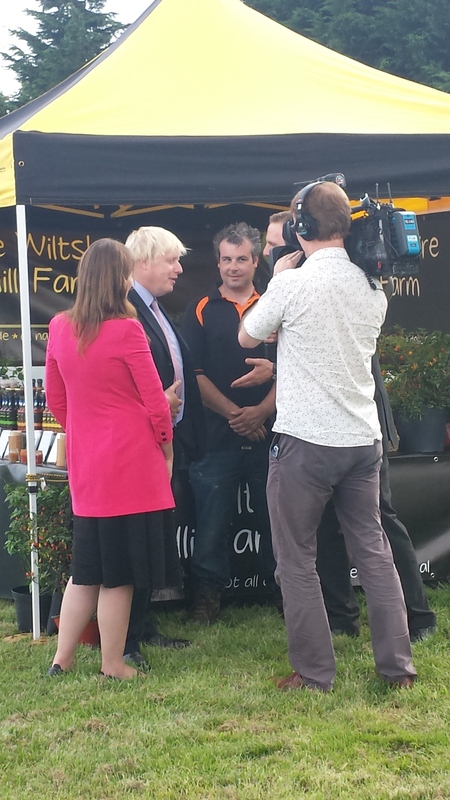 Biggest news of the last few weeks was the visit of the Mayor of London, Boris Johnson, to the Farm. 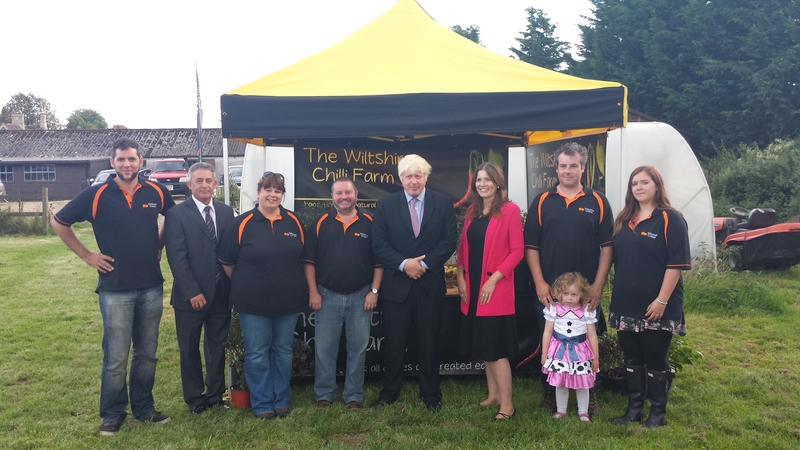 Local prospective Conservative candidate Michelle Donelan, who we have met before, had arranged for Boris to visit Wiltshire to champion what’s going on in our lovely county. Now as a serial chilli fan she chose us to represent the small business community, so we hastily arranged a bit of a tour of the facilities for Mr Mayor and his mad hair. 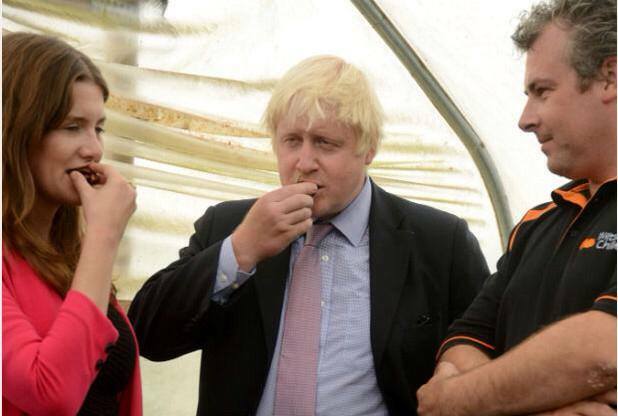 Now we all know Boris is up for a giggle, but little were we to know he was going to take a big bite out of the chocolate habanero that he’d just picked in one of our tunnels. Now for the uninitiated, these are pretty damned hot – hot enough to stop a man who many are calling a future Prime Minister from being able to speak. A politician lost for words? You’d better believe it. A swift can of sugary, fizzy stuff was procured to allow him to cool his gums before we could progress with the rest of the tour, but he now knows we mean business! After the polytunnel he was given a tour of the kitchen, and then of a market stall we had set up for the occasion, where he was interviewed by the local BBC news – who incidentally weren’t interested in local business, they just assaulted him with questions about UKIP and the general election. Now those of you that read my blog will know that I’m no lover of politics, or politicians. But Boris came across as being – well, Boris. No pre-prepared oily, slick responses to questions. No twisting the conversation to national issues when asked about local stuff – in fact, he dragged conversations back to the importance of local business when reporters insisted on asking about national stuff. He shook everyone’s hand on arrival, even the press. He just seemed to be exactly what you expect, no more, no less. I may not agree with his policies, and as a voter I am unlikely to put a big fat X in his box, but as a person I think he’s pretty genuine. Now, I hear you all cry in unison, did anything interesting happen at any of these events? Of course I met lots and lots of lovely people, and sold lots and lots of lovely stuff, but what was noteworthy…? 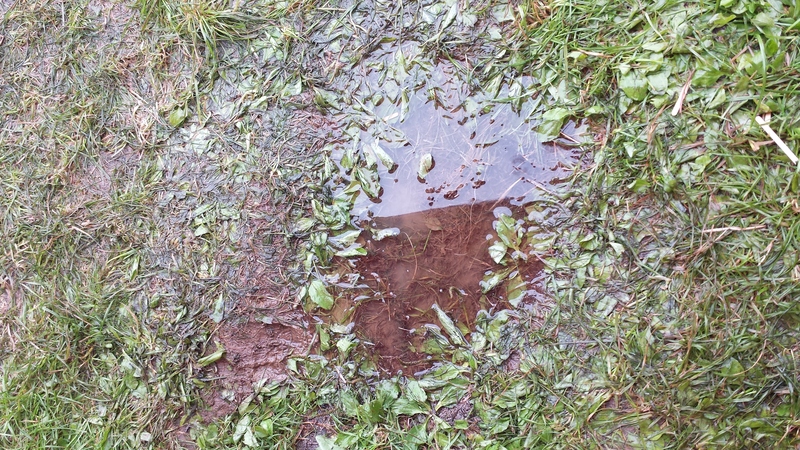 Westonbirt was a 3-day event – Treefest – in amongst the loveliness that is the Arboretum. It was a really nice event, although the Monday was blighted with utterly dismal weather. The forecast was 100% correct that weekend, so I knew it would be, and took a good book to fill in the blank spaces between customers. I’m not the sort to sit on my haunches whilst selling, preferring to be scanning the pack like a hungry lion looking for the kill, but when it’s bucketing down you have to keep yourself sane, and if that means a bit of Terry Pratchett then so be it. Unfortunately the event shall be forever memorable to yours truly for the hair-raising drive home. 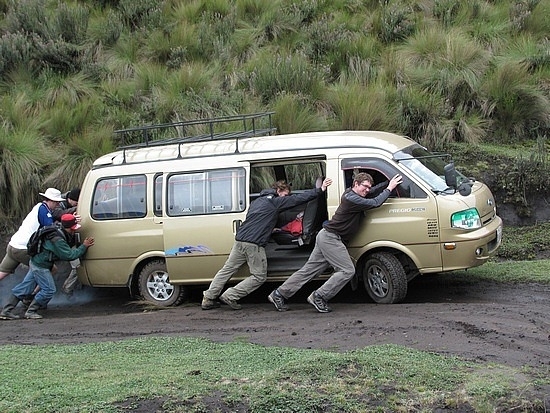 I packed up the van as usual, jumped in and pulled away, only to realise that I had no power steering. Now this is not a disaster, just a case of driving more carefully than usual as quick directional changes were simply out of the question in a van loaded up with gazebo, stock and a fat biffer in the driver’s seat. But what transpired was that it wasn’t just a power steering issue. The serpentine belt that connect loads of gubbins (that’s a technical term, people) under the bonnet had snapped, thus robbing the Silver Machine of its ability to top up the electrics. So, on the drive home, I was treated to a catastrophic failure of pretty much every piece of electrical equipment the van possessed. So first, as I said, the power steering went. Followed by the CD player. Followed by ABS. Followed by the wipers only just creeping across the windscreen. Alarm bells were going off left, right and centre with warnings coming up to tell me to STOP NOW OR THE VAN WILL EXPLODE, or something like that anyway. But I knew that if I stopped I’d never start again, so I limped home – with the engine stalling on me a couple of times and only restarting through a momentum-based jump start – in murky, rainy conditions. I have never been more relieved and surprised to make it home in one piece. However it didn’t quite end there. I somehow managed to reverse on to the drive (knowing I’d have to unload fully and send the van off to mechanic cousin Alan and his big bag of spanners), turned the engine off and unclenched. Then tried to open the door. Now of course, like all modern cars, my central locking engages when I pull away. So the doors had locked in Westonbirt, and now staunchly stayed that way as there was no battery power to unlock them. Locked in. OK, I thought, wind the window down. But I have electric windows. Still no battery power. Bugger, I thought, or words to that effect. So there I sat, relieved to have made it home…but locked in my own van, with now way of getting out! Now I’m not particularly claustrophobic but the thought of being in there for some time was making me a smidge anxious. I tried once again to unlock the doors and voila! there was just enough juice left to do the job…to a huge sigh of relief. So eventually the van got repaired, although it’s now at the body shop having its door fixed after the villainous exploits of Nottingham’s outlaws that I reported last time round. 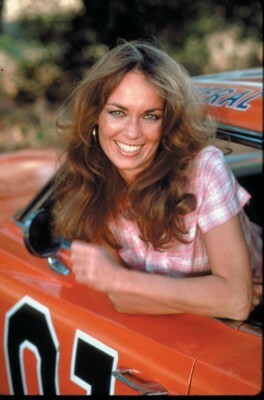 To be fair it has been quite a giggle leaping in through the passenger side Dukes of Hazzard fashion, but as Catherine Bach has remained stubbornly elusive I’ve bored of it pretty quickly. 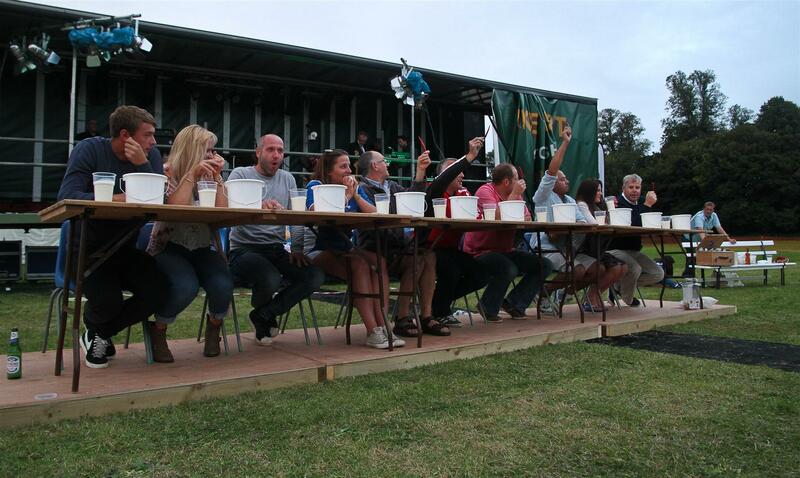 My trip to Potterne was to run a chilli eating contest at the cricket club‘s annual Beer and Cider Festival. Now Potterne is my home village, and I have played cricket for the club since 1978, so I was really looking forward to the day. I struggled to drum up support for the contest early doors, but as I suspected once the beer took affect, so the volunteers came, and by contest time I was actually turning people away. 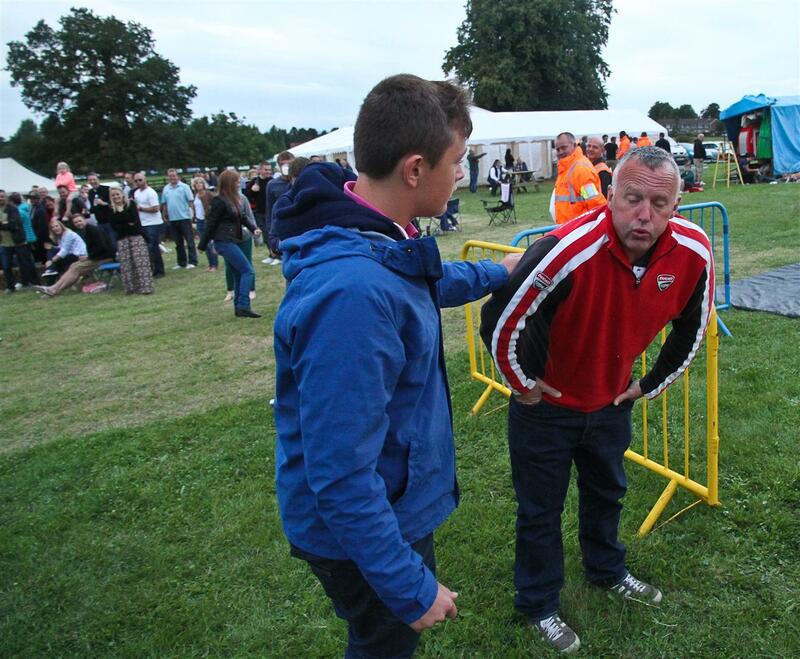 I’d never run one of these contests before, and I’m naturally quite reserved and shy (really, I am) so the thought of wandering round in front of an audience (which included my Mum) both running and commentating on a chill eating contest was – to say the least – nerve-wracking. But cometh the hour, cometh the hobbit and I simply engaged bulls**t mode and went for it. It was a very entertaining interlude…there were tears…there was swearing…there was a little bit of sick…and a bit of flashing…but all in all it went very well. The pre-match favourite Edgar won convincingly, with the scotch bonnet round getting all the other contestants running for the hedges at a speed that belied the amount of booze sloshing around their systems. 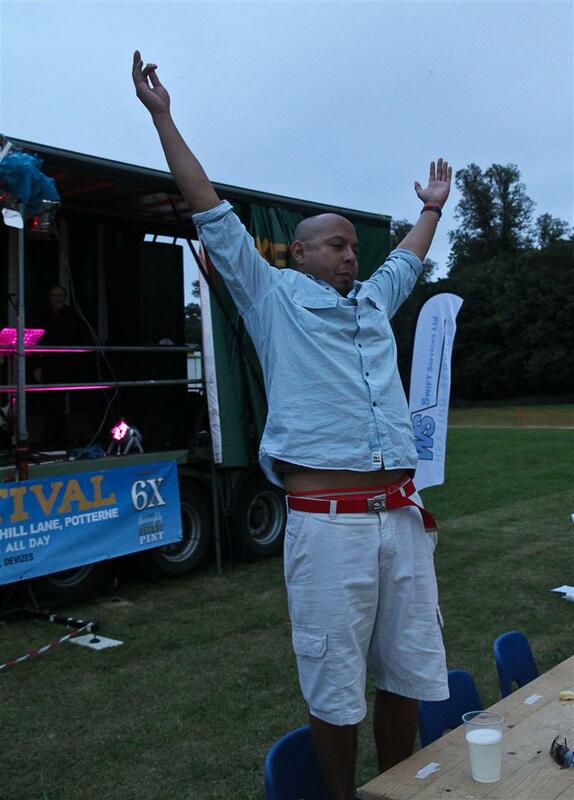 I was a bit naughty and got the crowd to encourage Edgar to jump straight to the peach bhut jolokia – the ultimate weapon in this contest – which he ate, though I think he regretted it afterwards! I really enjoyed doing the contest, and look forward to the next one. 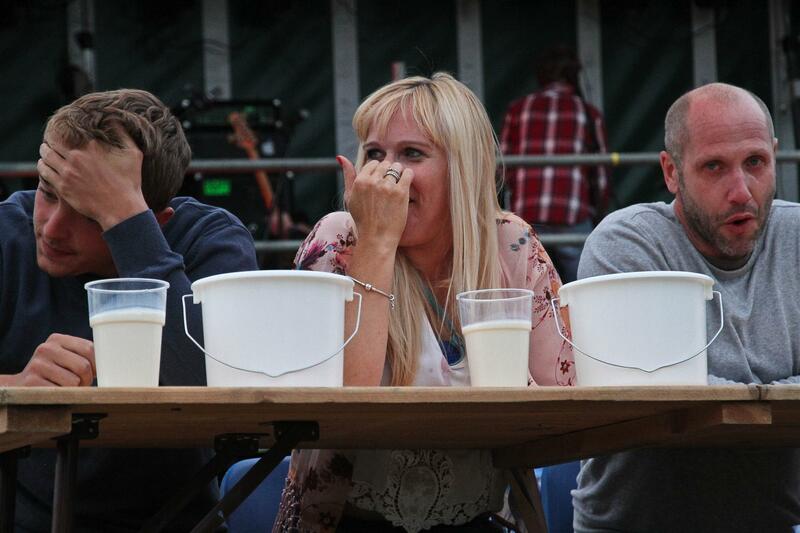 Thanks to Bloc from the club for all the chilli eating contest photos. 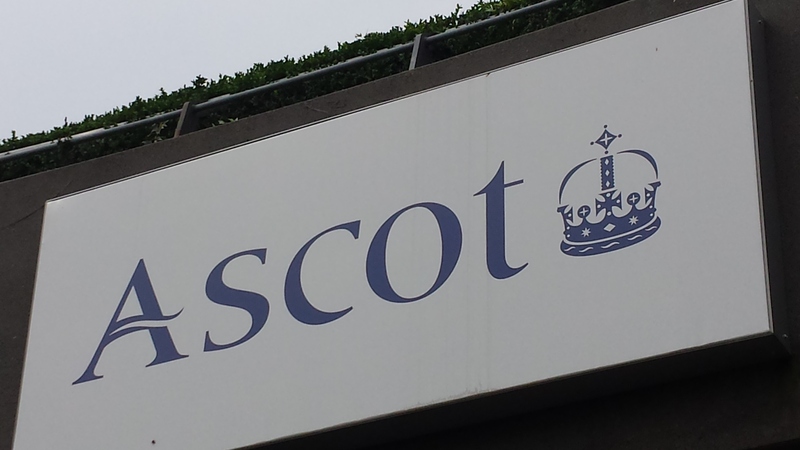 The other ‘first’ for me was a trip to the races at Ascot. Not for the racing, but to take part in the Festival of Food and Wine, which was on a glorious day last weekend. 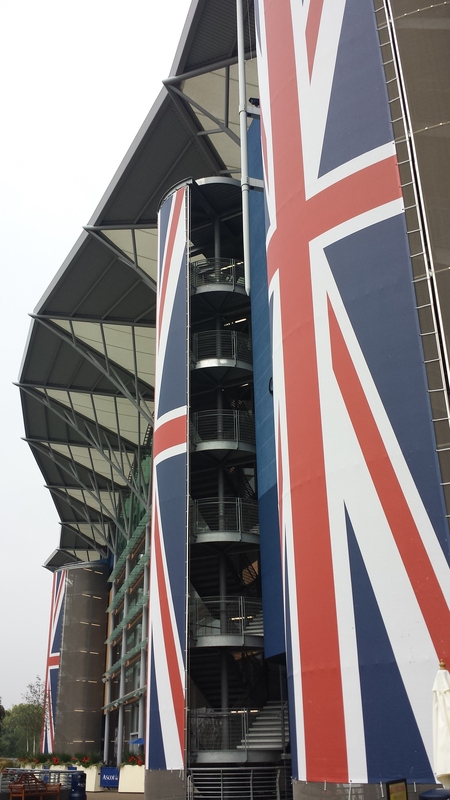 I’m not a horsey type, and apart from the National Lottery I don’t gamble, so a day at the races isn’t something that’s ever appealed, but it was an interesting experience. It was really busy, everyone seemed to having a good time, and what struck me was how much everyone dressed up for the occasion – especially the ladies. Some interesting hats were on display, some of which could only be called hats due to their heady location…but that’s fashion for you I guess – I’m not one to criticise, what with my Don Estelle shorts and 3-for-£15 t-shirts. But really…something that looks like half a giant Rolo with a flower stuck in it? A hat? So I think I’ve waffled enough for one week, now that the lunacy of the last few weeks has died down I’ll be back to weekly updates. You have been warned. This weekend sees me in Sherston and Bristol’s Tobacco Factory. with the Pink Chilli Hobbit in Avebury and Chippenham. You can also find us in Frome at the Cheese Show, the Holker Chilli Festival and our usual haunts in Swindon Designer Outlet, Bath Union Street and the Chilli Hut in Green Park, Gloucester Green and Summertown Market in Oxford, and Reading Farmers Market. We were due to be at Potterne Food Festival, but sadly the event has been cancelled. Thought for the day: why is the hand wash I’ve just bought say that it’s invigorating? Do I need invigorated hands? This entry was posted in Chilli, General and tagged Ascot, Boris, Boris Johnson, chilli eating contest, Treefest, WCF. Bookmark the permalink.